On August 21st, in Charleston, West Virginia, during President Donald Trump’s address at his rally, he doubled down on the topic of the social media giants’ censorship of “free speech”, most notably of conservative voices in the online community and beyond. Almost like an inner vibration of synchronicity in the minds of the silenced masses, the notion of overturning the incredibly biased social media companies that are “shadow banning” and blocking conservative news outlets took centre stage during a portion of Donald Trump’s latest speech. Once again, Donald Trump is absolutely correct. The censoring of free thinkers and the conservative voices of the alternative media has become so apparent, that many have already abandoned Facebook and opted for lesser social media platforms as a result, due to their obstructionist tactics in favouring only leftist ideologies whilst suppressing all the other news and views that they don’t feel fit into their leftist narrative. President Trump vowed to aggressively fight the imbalance against these large social media companies, and he added that the “fake news” term and mainstream media effort to fight it, is nothing more than an agenda to silence conservative or opposing voices. Wow! This is great news! 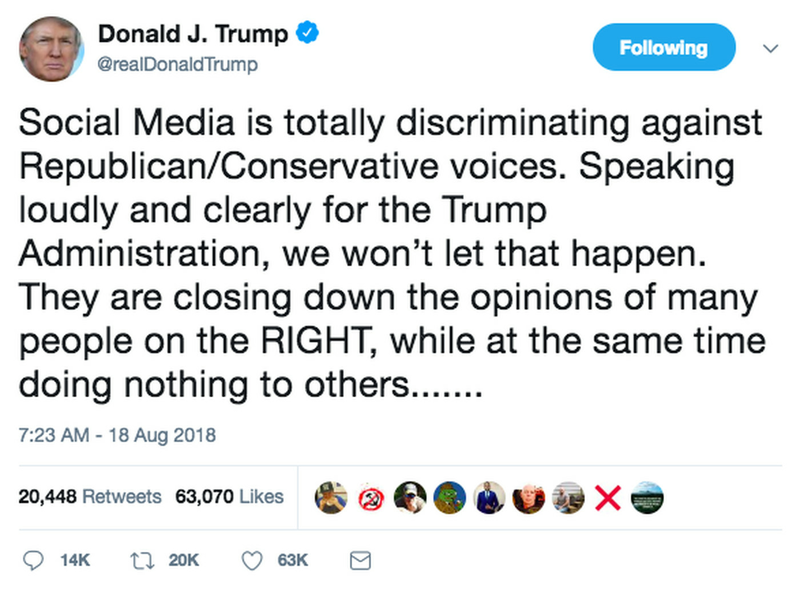 Donald Trump hits the nail on the head yet again, and in knowing that he’s fully aware of the incredible social media bias and censorship problem, speaks volumes for the future of “free speech” in America and beyond. It’s welcome news for even news sites like ourselves. Why you might ask? Well, don’t you also believe that “free speech” is important, and that the news propaganda law that Barack Obama passed whilst he was president changed the entire face and output of mainstream news media outlets during the last six years of his tenure? We definitely think so. Better yet, we know so! Coincidentally, after the 2016 US election, the Democratic Socialists effort after Hillary Clinton’s loss meant that the social media giants began silencing websites on a grand scale, and the mainstream media even coined the term “fake news” in order to cover up multiple Democrat scandals, and thus, prevented real news and views from reaching audiences that weren’t apart of the liberal agenda. Indeed, Silicon Valley escalated censorship of conservative websites, news sites, as well as many free thinkers from social media platforms like Facebook, Twitter, and even on Google’s hugely popular YouTube service. Unfortunately, the shadow banning of many websites and pages on social media has been ever present on all platforms since before and after the US election of 2016. This is all evidenced by the massive amounts of people and small/big news sites that have had their social media accounts banned or even shadow banned. A lot of conservative news sites, however big or small, have been silenced across all major social media platforms for a long time already. We love this new thing, because we firmly believe in a “free press”, plus the freedom to think, and be allowed to share a different opinion backed up by facts, rather than one side or the other being silenced on social media, in order to serve a larger political agenda that is seemingly decided by totalitarian-esque censorship tactics which are supplementing only one side of the argument/story. That’s not a free online society, is it? In conclusion, when only leftist views and ideologies are allowed to flourish by tech giants, and anything else that doesn’t fit into their narrative is suppressed to no end, then how is that fair? Hopefully soon, this very biased censorship operation may soon be coming to an end. Wouldn’t that be something just? We love Google, Facebook and Twitter, but only if they play ball and play ball fairly, right?